This spring and summer have been exciting months at the Kansas Agricultural Watershed (KAW) Field Research Facility. 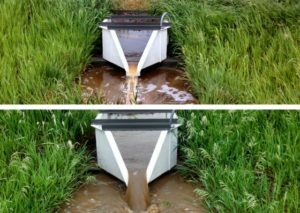 Nathan Nelson, Professor of Soil Fertility and Nutrient Management at Kansas State University, and his team have been busy measuring runoff and water quality to determine how different agricultural conditions impact phosphorus (P) loss. In Kansas, fall broadcast P fertilizer application is common due its low-cost and the workload efficiency it provides. However, research shows spring injected P fertilizer application results in less P loss. That said, previous research looks almost exclusively at spring injected verses spring broadcast. Nelson and his team set out to investigate fall broadcast, when there tends to be fewer rain events, and spring injection for changes P loss conditions. They are also examining how cover crops in combination with different fertilizer applications effect P loss and runoff. Their goal was to determine if different combinations of best management practices could positively impact environmental conditions. For example, could cover crops in combination with fall broadcast reduce P loss and runoff? According to Nelson, the data doesn’t find this to be the case. Preliminary results show that fall broadcast continued to have more P loss than spring injected application, and cover crops did not reduce the amount of P loss for either system. The research team found that cover crops did result in less sediment loss, between 50% and 70% less even on no-till plots. Results also demonstrate that while the amount of P loss stays the same, the form changes. Cover crops resulted in a decrease in particulate P but an increase in dissolved P leaving the field. Two watersheds at the KAW Facility after a large storm event. The above is a field with cover crops, the below is a field without cover crops. Overall, Nelson and his team found that cover crops changed the runoff dynamics of the fields. Fields without cover crops had higher peak runoff, whereas those with cover crops had lower peak runoff levels but the duration was longer. In addition to this project, Nelson and his team are also looking at the impact of cover crops on soil health and water quality. Preliminary data shows that cover crops are having an impact on soil health, but it will take time for the soil to change and for the team to determine how this change impacts water quality. In the next year and a half, Nelson and his team are hoping to be able to provide some insight on this complex relationship. Dr. Nathan Nelson is a professor in K-State’s Department of Agronomy, specializing in soil fertility and nutrient management. His research projects primarily explore nutrient management, cycling, and distribution within soil profiles and across landscapes. Part of this research is investigating ways to increase the efficiency of phosphorus applications in agriculture, with a main goal of increasing food production while reducing phosphorus runoff into surface waters. In 2014, Dr. Nelson established the Kansas Agricultural Watershed Field Laboratory, a large in-field water quality laboratory at the Ashland Experiment Farm near Manhattan, KS. This facility is used to investigate effects of agricultural systems on surface water quality and develop and verify best management practices to reduce non-point source pollution from agricultural lands. A native of Manhattan, Dr. Nelson graduated from K-State with a B.S. in agronomy before moving to North Carolina State University where he received his M.S. and Ph.D. in soil science. 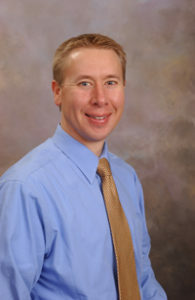 He worked with the USDA-ARS as a Soil Scientist at the Northwest Irrigation and Soils Research Lab prior to joining the K-State faculty in 2005.